Educational institutions are always in contradictory conditions, if we mention their IT facilities, namely networks (with all their infrastructure, software and staff). On one hand, education is the fundamental priority of any society. On the other hand, most educational entities are on a tight budget and can’t spend much money on their IT needs. As a result, the networks of universities, colleges, schools etc. are almost always inefficient, containing a zoo of hardware and software, and there’s always short supply of staff able to maintain the networks and all the is related to them. There’s often no adequate security policy, and it’s hard to supervise the whole network, due to its structure and heterogenous nature. In such a situation it becomes a vital task to watch all the activity within network, to get informed quickly of all the undesirable events, services failures and so on. It’s next to impossible to perform such actions manually; and the built-in means of system monitoring and security enforcing are not enough to guarantee that the overall network state will be stable and prone to possible security threats. The absence, or low quality of maintenance work may have unpredictable consequences. The users of education institutions are often not capable of maintaining the due level of security; moreover, some of these users and their actions may be a serious security threat due to a lack of knowledge and experience in IT-related area. In such a situation, network becomes quite vulnerable and subject to all kinds of unauthorized activity, malware infection and so on. 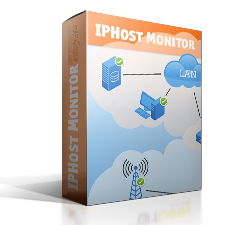 IPHost Network Monitor is a solution to this kinds of problems; using its Remote Network Agents it becomes possible to watch over all the network’s activity, hardware state and become notified promptly in case of any kind of hardware and/or software failure. How can IPHost Network Monitor be used to allow maintaining education organization’s network? First, there should be a command-center, a computer where the main installation of IPHost Network Monitor resides. If current network’s architecture and operation mode doesn’t allow accessing all the network devices subject to monitoring, the analysis should be made to understand how many interconnecting segment of the network exist, that could cover all the monitoring tasks if an additional installations of so called Remote Network Agents are made in every such a segment. Remote Network Agent is, basically, a data collector installation of the monitoring software. All it does is gathering data and either sending it on request, or sending it itself, depending on how the segments are connected (say, if segments are protected by firewall, the agents should be tuned to send the collected data to the command center installation, rather than waiting for a signal to do so. Depending on what types of network devices are present (workstations, servers, other types of computers, network routers and switches, network printers and so on), the set of required monitor types can vary. In a typical situation, we could use the following types: ICMP, TCP, ODBC, HTTP(S), SMTP, IMAP, File size, Web Transaction Monitor.The monitoring network should also make use of several notification media (the common error is trying to use email notification only; in case there are connectivity issues, these notifications wouldn’t make it in time. Using SMS is recommended for all monitors related to email and Internet connectivity. ICMP, or PING monitor can be used to tracerotue a netwrok device, or check its presence (in case the device responds to ICMP echo requests). Bothare basic network tols used to troubleshoot network nodes problems..
TCP monitor allows to establish a connection on given port. It can be used to make sure a given protocol is supported (i.e., the network device listens on the specified port). ODBC monitor is a generic tool to monitor RDBMS and other data sources presence and validity; ODBC is used on several popular platforms and is a uniform means to check the state of miscellaneous database backends. HTTP(S) monitor allows to load a webpage (URL) and, if necessary, find (or make sure it’s not present) a string in the downloaded page. Useful to make sure Web sites or Web interfaces to a number of network devices is alive and replies as expected. SMTP server monitor can be used to check whether MTA (mail transfer agent, or outbound mail server). Useful to make sure mail delivery is supported. 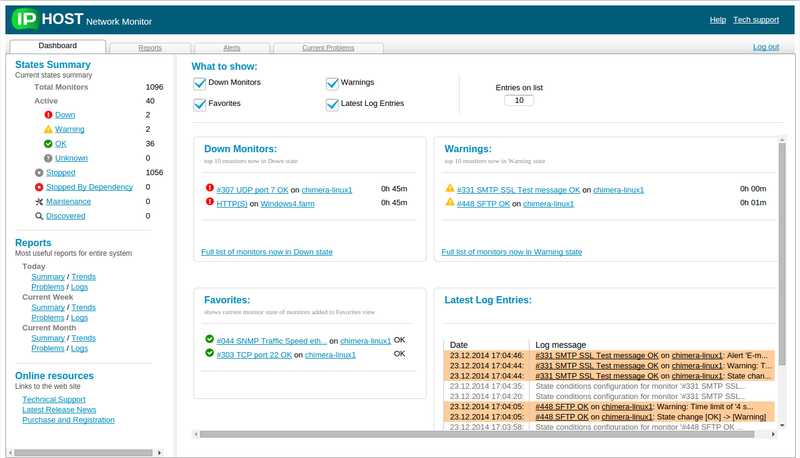 IMAP server monitor is used to make sure users can read incoming email. IMAP is an advanced mail-related protocol, allowing to store message on server and provide uniform access from anywhere. 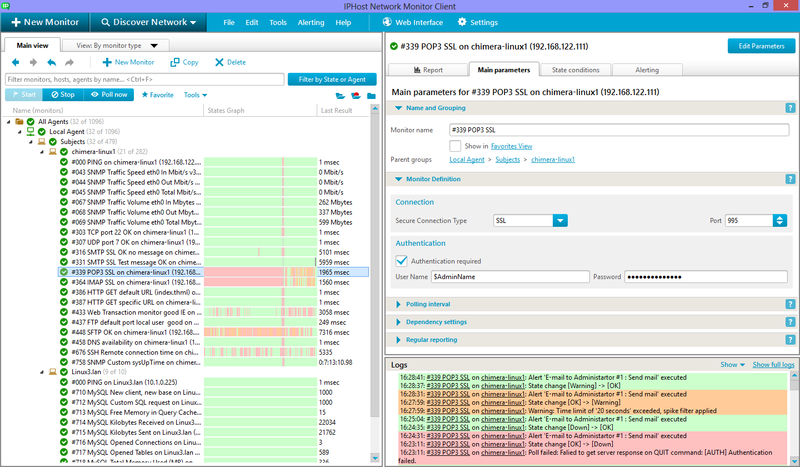 File size monitor can be used to check for certain file size limits, e.g. mailbox size, temporary system files size and so on. Web Transaction Monitor allows to emulate actions of a user navigating Web: it records what user does and can replay that; it also allows to look for a given string in the resulting output. A convenient way to access Web resources requiring authentication.